I wanted to be a fashion designer when I was growing up. I sewed a lot of my own clothes and spent my first year after High School studying a Certificate of Fashion where we sketched designs, drew up our own patterns and constructed them, I loved fashion! Although my more recent past has strayed from the fashion industry, I’ve continued to follow the trends of how we put our wardrobes together and how we use the clothes we have. Today I’d like to talk about consciously creating a wardrobe you love with three different approaches with a similar theme. Firstly lets look at the theory behind the book written by stylist Wendy Mak; The Capsule Wardrobe: 1000 Outfits From 30 Pieces. Wendy suggests placing a clothes peg on your clothes when you wear them (similar theory to turning the coat hanger around when you wear it) so you can see which clothes you wear and which ones you don’t. From there Wendy goes on to say “After about a month you can take a step back and say “These are the clothes that I wear all the time’ and assess whether you need to buy more of those, or move out the things that you don’t actually wear”. I like the simplicity of this theory. Read the whole article, or search out her book for further details. Moving on to the next approach to creating a wardrobe you love, many of you would have heard of Project 333. A clever initiative by Be More With Less founder Courtney Carver. Courtney began this fun challenge almost 7 years ago and since then it’s been embraced by many around the world. Courtney has a number of articles that explains to start by taking inventory of what you have and then build on your “I love” pieces until you get to 33 pieces that you will wear for the next 3 months. Personally, I haven’t tried this strategy yet, but I’m keen to try it in the near future. In her article Inside My Minimalist Wardrobe, Brooke McArley, founder of Slow Your Home explains a slightly different approach to the clothes in her wardrobe that evolved over the years. Brooke is less about thowing everything out and starting again, and more about being mindful of what you wear and what you will replace it with in the future. I like Brooke’s individual style and how she’s cultivated it. Of course the underlying theme of all of the above is having less and loving what you have (a great theory to apply to almost everything!). When you consciously create a collection, you know it all goes together, so you don’t need to try it on to see if it works. You can grab your outfit, get dressed and get on with your day. Although I’ve been talking recently about storing your stuff…. today’s theme stems back to articles I was writing earlier in the year about creating healthy habits. What can we do each day to move us toward the life we want to live? The more of our life that we can plan beforehand, like what we’re going to wear, and then just do on autopilot frees us up to deal with all the other stuff that life throws at us. 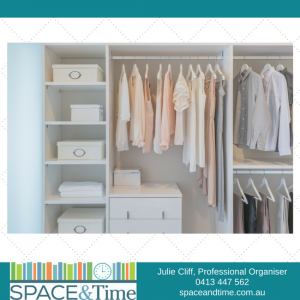 Or if you need a hand to edit your wardrobe using one of the above techniques check out my Decluttering Services or Contact me today to discuss how a few, well made, conscious decisions can help you move you towards the life you want to live. Enter your details below to receive my monthly newsletter. As thanks for subscribing I'll send you my 10 Tips for Tackling Desk Clutter. Need help with your life admin? I was recently gifted my Grandmothers wedding dress from 4 April 1940 (see pic below of Grandma standing on a box beside my Grandpa). I asked my followers where they store their wedding dress. Claire said "someone has perhaps used my 3/4 length white leather and tulle wedding dress which was sent to an op shop some 10yrs ago when it turned 21. Coming of age and a new chapter." I love the idea of a celebration to let go of something you no longer need. Did you see my post last week about life admin? Life admin is all the stuff that needs to be done to run a household. My number 1 tip in the blog is outsource! Which bits on to do list can the kids take on? Which bits can your husband help out with? Which bits can your neighbours, friends or other family members help out with?